CLEVELAND, March 4, 2015 /PRNewswire/ — Manufacturing marketers are turning their attention toward sales as a primary goal for content marketing. That’s just one of the findings in the research released today by the Content Marketing Institute (CMI). 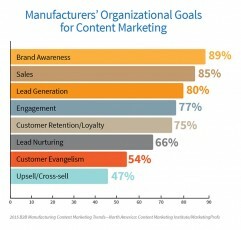 The second annual B2B Manufacturing Content Marketing: 2015 Benchmarks, Budgets, and Trends—North America report, sponsored by Fathom, shows how B2B manufacturing marketers have changed their content marketing practices over the last year. Eighty-five percent of manufacturing marketers cite sales as a goal for content marketing (versus 56% last year), putting sales right behind brand awareness (89%). However, fewer than half use sales to measure content marketing success. In fact, out of all the groups CMI studied this year, manufacturing marketers have the most difficulty tracking ROI on their content marketing programs; only 12% say they are successful in doing so. This year’s research shows that manufacturing marketers have made numerous other changes this year compared with last year. Video is the number one tactic this year, with 87% saying they use it. Indeed, manufacturing marketers use video more than any other group CMI has studied this year. However, fewer say video is effective this year (65% this year vs. 71% last year). The social media platform manufacturing marketers use most to distribute content is LinkedIn. However, they say it’s not as effective as last year (56% said it was effective last year versus 54% this year). On the other hand, they say YouTube is more effective for them (66% this year versus 59% last year). There are many more eye-opening findings in the full report. Our SlideShare presentation is available for download. Graphics, charts, pictures, quotes and more, are available in Dropbox. Content Marketing Institute is the leading global content marketing education and training organization. CMI teaches enterprise brands how to attract and retain customers through compelling, multi-channel storytelling. CMI’s Content Marketing World event, the largest content marketing-focused event, is held every September in Cleveland, Ohio, USA. CMI also produces Intelligent Content Conference, Content Marketing Sydney and Content Marketing Singapore. CMI also publishes the bi-monthly magazine Chief Content Officer, and provides strategic consulting and content marketing research for some of the best-known brands in the world. CMI is a 2012, 2013 and 2014 Inc. 500 company. Watch this video to learn more about what we do.